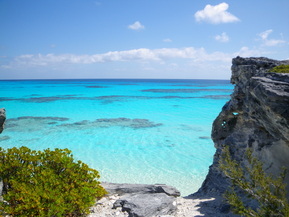 Everything south of Rock Sound is described as South Eleuthera. It becomes rather sparse in the terms of settlements, largest being Greencastle, Deep Creek (home of the Gully hole) and Freetown, all of which are on the southwest end of the island. This part of the island can feel quite remote, but has some of the most spectacular beaches. On the southwest tip of the island is the Cape Eleuthera Resort and Marina, which has closed up post of its facilities but still has a small general store. The Cape Eleuthera Institute and Island School are just before the Cape Resort. The institute works hand in hand with the community focusing on sustainable living and a variety of ecological research focused around Eleuthera's diverse marine habitats. The southeast part of the island is dotted with the small settlements of Waterford, Wemyss Bight, The Village, John Millars, Millars and Bannerman Town. Many visitors do not venture to this part of the island which is full of scattered little farms, old ruins and ghost towns from Eleuthera’s vibrant past. Some visitors do make long and adventurous journey through the rough roads to famously beautiful Lighthouse Beach at the very southeast tip of the island. It is arguably the most beautiful place on the island, well on earth really, but the road is not for the faint of heart or inexperienced back roads drivers. Just outside Bannerman Town is the Princess Cays Cruise Ship stop. Tourists from the ship stop here for a few hours and soak in the sun or take a tour to Lighthouse Beach or Rock Sound.